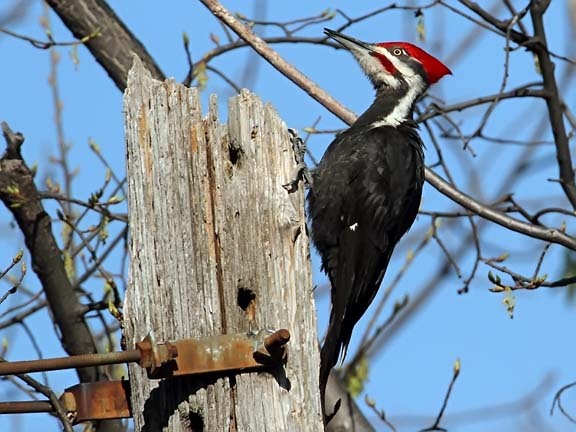 The pileated woodpecker is the largest woodpecker that we have here in Minnesota, they are just slightly smaller then a crow. They are so large that the holes that they excavate in trees in search of ants often attract other birds. These holes are usually rectangular in shape. 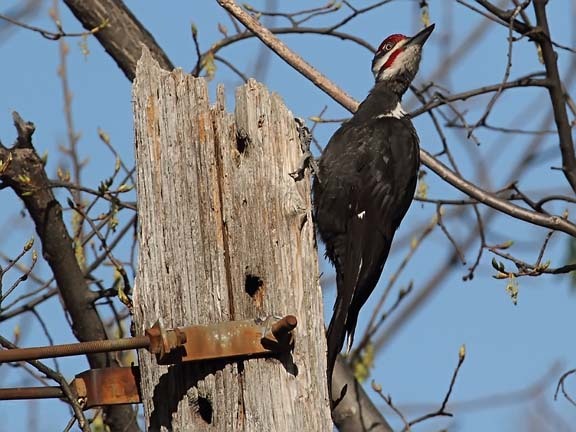 Pileated woodpeckers stay on territory all year long. Both male and female will defend the territory, although they are more tolerant during the winter. They nest in a cavity that they excavate typically in a large dead tree. The nest is not lined but usually contains wood chips left over from the excavation process. Great shots, I love the Pileated woodie. I love his red hat and his very fashionable stripe down his face and neck! Do they tolerate humans or were you away quite a bit? Our woods are always ringing with the tapping these birds make. Love them. Very interesting! They are a striking bird with the red and the shape of their head. So lovely - what a gorgeous head of feathers! That second shot is really good. I've never seen one of these before. Rarely see woodpeckers in our area at all anymore.